Instagram is now the most important social media for online retailers. It’s not just selfies, smoothies, and cute kittens out there! This is a serious return on investment. It’s making independent online store owners thousands. Because Instagram posts gather more engagement than Facebook and Twitter combined. And it’s creating a new legion of independent tastemakers and influencers. Meet Danielle Bernstein. She owns an Instagram account with 1.3 million followers. She’s 22 years old, and runs an independent online store and fashion blog. It’s called We Wore What, and it’s huge. There is no big business or corporate overlords pulling the strings. Just a smart woman with a laptop and an Instagram account. Independent and boutique. She sells shoes, bags, and clothes directly through her website. She also runs an affiliate store, selling clothes via Stella McCartney, Miu Miu, and Moda Operandi. But here’s the headline. According to an interview in Harper’s Bazaar, she makes $15,000 every time she uploads a sponsored post on Instagram. This is the new business model in online retail. Why does it work? Because it goes further than the traditional shopping experience. yes, she runs an online store. But Danielle is also a tastemaker. A fashion guru, and and sharp-as-hell business-woman. In the world of online retailers, Instagram is taking over. It’s now more powerful than Facebook and Twitter for independent sellers. Instagram posts get 58 times more engagement than Facebook. And 120 times more engagement than Twitter! Instagram is also the fastest growing social media platform. It has just overtaken Twitter in terms of overall users. The rate of follower growth on Instagram is also significantly faster and higher than Facebook. Instagram is the most engaging, fastest growing, most socially relevant platform on the planet right now. Let’s talk more about Danielle Bernstein’s lucrative Instagram/retail model. Thanks to her online store, her blog, and her Instagram following, she’s considered an Instagram influencer. That’s where the big money is. Brands spend more than $1 billion every year to sponsor Instagram posts. Thanks to her 1 million followers, she can comfortably command between $5,000 to $15,000 for a sponsored post. For example, Danielle will post a picture with a certain bag. Or she’ll wear a particular brand’s sunglasses for a fee. Danielle’s posts are very subtle, and very natural. It’s almost subliminal. At the same time, every post is sending thousands of people back to her online store, and strengthening her brand. Danielle’s reach is enormous, but even Instagram accounts with 5,000+ followers can start making a little money through sponsorship. 5,000 followers is a pretty attainable for the average online business, wouldn’t you say? By now, you’re probably wondering how to grow your numbers! It’s a long road to a million followers, but we’ll start small. 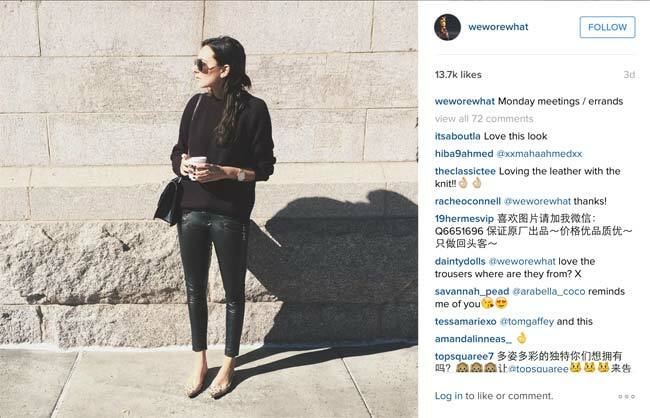 There’s one simple reason why Instagram rules for online retailers. It makes their products look real. Smart marketers know that the best way to sell a product is to sell a lifestyle. Don’t tell us what the product is, show us how it will change our life. 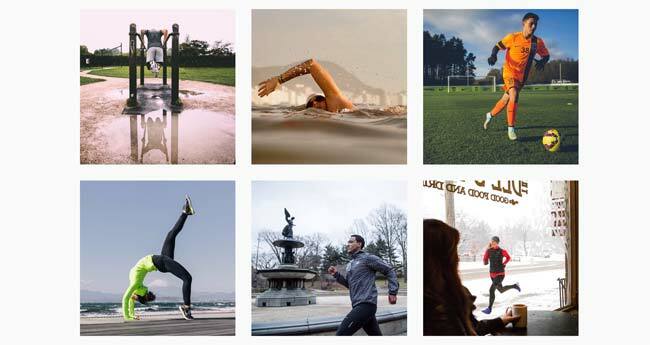 Just look at Nike’s motivational Instagram feed. It’s full of real people running marathons, playing basketball, swimming. It’s all real. It’s relatable. It’s a lifestyle. Not many of us can relate to a picture of a model in a catalogue. But, when customers post real pictures of your products on Instagram, it reacts with people. It looks real. Customers can imagine themselves wearing the same thing. It’s much more effective for selling. 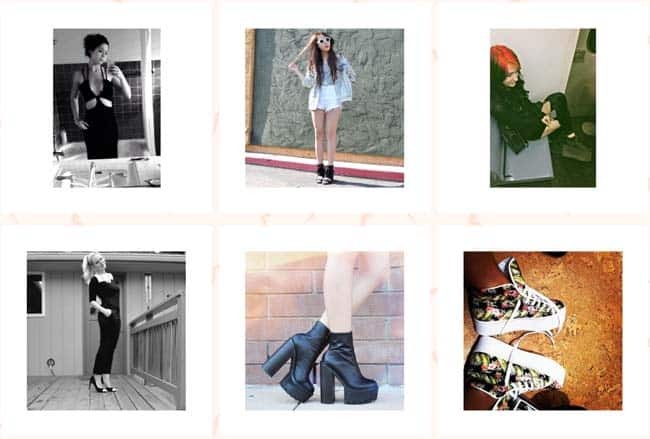 Online store, Nasty Gal asks their customers to take photos of themselves and use a specific hashtag on Instagram. They collect the images, and highlight them on their website. They’re getting huge social reach, and a whole catalogue of natural product shots. Their customers are doing all the work for them! You can pay Instagram influencers (like Danielle) to post about you and your products. Not many of us have $15,000 lying around! But, there are smaller accounts to start with. 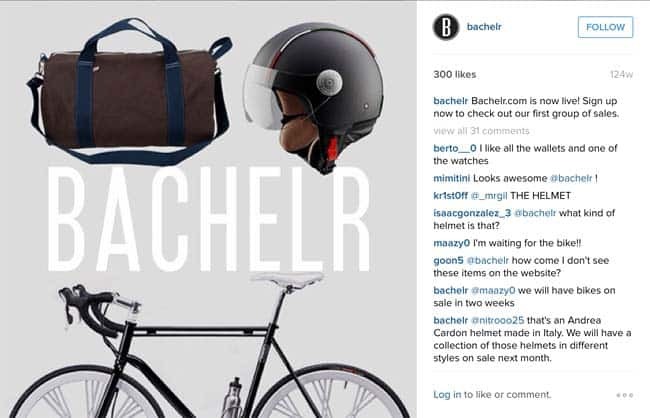 Men’s fashion company Bachlr started from almost zero Instagram followers. They paid a variety of influencers for sponsored posts. The response was so powerful, it crashed their server. I contacted and set up deals with a few accounts with 100k+ followers that were targeted towards men. To my surprise, many of these users were willing to do promotional posts for around $50… awesome! They’ve now got 15,000 followers, and enjoyed 20,000 visitors to their store in two weeks. Not only that, but they’re now in the position to charge for sponsored posts themselves! The hardest part about building an Instagram following is getting the ball rolling. How do you find those first 100 followers? The first 1,000? The quickest, and most effective method, is hunting out active users that will like your posts and products. Start looking at similar accounts to you. Load up their follow list, and start engaging with their most active followers. ‘Like’ their photos, comment on pictures, and follow them. It won’t be long before you get your first follow back. And then a like or two. Repeat this process in little stages every day, and you’ll start to build a good following. I’m going to finish on a quote from our good friend at Kalen at Bon Bon Boutique. She recently let us in on the secrets behind her online store success. One of the standout quotes of the interview was “be the fashion”. It’s an attitude that has created enormous success for Danielle Bernstein, who I talked about at the beginning of the article. To take your online store to the next level, you have to become more than just a seller. You’ve got to become a tastemaker. An influencer. It’s all about creating a 360 business model that goes beyond the traditional buy and sell. And that’s why Instagram is the best social media for online retailers. It’s a new model that combines online selling and magazine/media. And it’s one that you can master for your home business. Is anyone out there getting great results from Instagram? I’d love to hear from you!